The specter of Ralph Nader has haunted the Democratic Party throughout the final months of the 2016 election. Worried that disaffected voters would be drawn to candidates like the Green Party’s Jill Stein, Clinton’s super PAC, Priorities USA Action, has launched a multimillion-dollar campaign to warn people that “a vote for a third-party candidate is a vote for Donald Trump”.1 Former Vice-President Al Gore has been enlisted as well in this effort to convince people that Ralph Nader’s insurgent challenge for the presidency in 2000 “spoiled” Gore’s campaign and threw the election to George Bush. Countless liberal think pieces have told and retold this cautionary tale as a warning to anyone who dares try to build independent working-class politics. For Democratic Party apologists, Ralph Nader’s campaign is a cautionary tale about the dangers of “ideological purity.” But Nader’s presidential run in 2000 was the most successful left-wing independent presidential campaign in decades. While the tight election and massive campaign against him squeezed Nader’s vote to only 3 million (3% of the vote), his support and political impact was far greater. 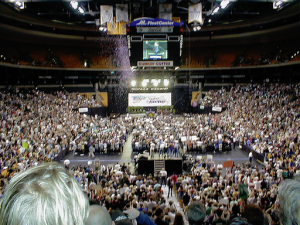 Even his other presidential runs, in 1996, 2004, and 2008, despite their smaller scale, provided activists with valuable training in independent politics. Nader’s challenge to the two-party system does have important lessons for the left: just not the lessons the Democratic Party wants you to learn. The Nader campaign didn’t come out of nowhere. It was the product of accumulated discontent at Bill Clinton’s America, the two-party system, and international capitalism. After eight years of Reagan and four years of Bush Senior, Clinton’s “New Democrats” continued the same neoliberal policies when he took the White House in 1992. He vigorously campaigned for and passed the North American Free Trade Agreement (NAFTA). This freed up more markets for U.S. corporations but provided little protections for workers’ rights or the environment in Mexico, Canada and the U.S. NAFTA and many other “free trade” policies Clinton pushed accelerated the flight of jobs to cheaper labor markets. He “ended welfare as we know it,” passed the anti-LGBTQ Defense of Marriage Act, and enacted destructive sanctions against Iraq. Nader began his political life as a consumer advocate, first coming to fame with his exposé of the automobile industry in the 60s. By the 70s, he had become disenchanted by the Carter administration and pushed in the direction of independent politics. He first dipped his toe into the water in the 1996 election by allowing the newly formed Green Party to put his name forward on the ballot. At the time, however, Nader didn’t engage in any campaigning, was only on the ballot in 22 states, and only got 0.71% of the vote. This was not the only attempt at building independent politics at the time. 1996 also saw the launching of the U.S. Labor Party, full of lessons in its own right. Provoked by the passage of NAFTA, ten labor unions declared their intent for form a new party on a clear working class basis. Basing itself on one million union members, the Labor Party had a much wider potential base of support than the Green Party or the 1996 Nader campaign. Socialist Alternative played a leading role in several key Labor Party chapters, and argued for it to run candidates at the local and national level. Ralph Nader was a member of the Labor Party, not the Green Party. But the Labor Party leadership squandered the opportunity to build by blocking attempts to actually run candidates, including the opportunity to nominate Nader as their presidential candidate in 2000. So when a wave of discontent broke out and Nader decided to mount an energetic campaign for president, he accepted the Green Party’s offer to put him on their ballot line. And it was the Green Party, not the Labor Party, that was catapulted into the spotlight. In 1999, the World Trade Organization (WTO) was scheduled to meet in Seattle. Labor activists, environmentalists, and anti-sweatshop campaigners coalesced in Seattle and, through mass direct action, shut down the WTO meeting. This kicked off what was dubbed the “anti-globalization movement” as activists would gather to block the meetings of representatives of global capital. The movement spread like wildfire across the globe in a series of combative mass demonstrations uniting workers, environmentalists, and radical youth. This popular movement targeted the major institutions of neoliberalism backed by the Democratic and Republican parties alike, and anti-corporate ideas became more widespread. The mass direct actions of the anti-globalization movement continued into the election season as thousands flocked to Philadelphia and Los Angeles to protest the Republican and Democratic conventions. Socialist Alternative mobilized activists to both protests. The DNC protests in Los Angeles provoked violent repression, with police firing rubber bullets into the crowds. The movement wasn’t going away. Nader himself played a leading role in preparing the WTO protests and anti-globalization movement. 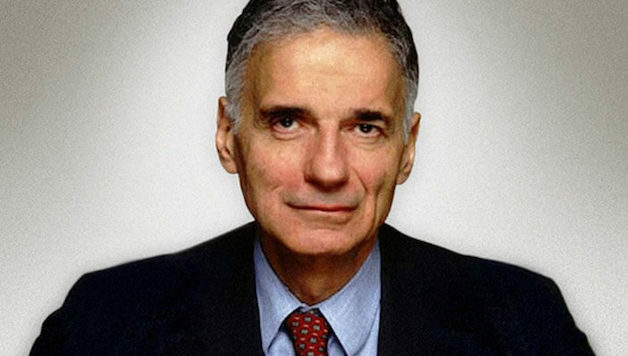 When he ran for president again in 2000, Nader was able to serve as the electoral voice for that movement. The 2000 presidential election saw Clinton’s vice president Al Gore take on George W. Bush, the son of the previous president. Whatever differences existed between them, they both stood for the neoliberal agenda that people were taking to the streets to oppose. In contrast Nader refused all corporate donations and campaigned on a program of single-payer healthcare, a living wage, repeal of anti-union laws, and the abolition of the death penalty. Although Nader was not a socialist or even anti-capitalist, he took a strong stance against the influence of big business in politics. Nader tapped into a ferment within the labor movement and received some important union endorsements. This included dozens of union locals including AFSCME Local 1108 in Los Angeles, the Seattle locals of the Postal Workers and Teamsters, and the California Nurses Association. While most national unions blocked internal discussion to prevent a Nader endorsement, Nader received the endorsement the United Electrical, Radio and Machine Workers at their convention. Prominent civil rights leaders like Manning Marable and Cornel West backed Nader, as did liberal personalities like Bill Murray, Susan Sarandon, Warren Beatty, and Michael Moore, along with a long list of popular musicians including Patti Smith, Eddie Vedder, Ani DiFranco, Jello Biafra, and Willie Nelson. Despite the media blackout, Nader found an audience. Across the country, the campaign held “super rallies” of thousands of supporters who filled up stadiums and paid $10 each for the opportunity. Nader drew 15,000 people to Madison Square Garden in New York City, 14,000 to the Target Center in Minneapolis, 12,000 to the Fleet Center in Boston, 10,000 to the Pavilion in Chicago, 10,000 to the Coliseum in Portland, 10,000 to the MCI Center in Washington, DC, and spoke to dozens more rallies several thousand strong.4 This kind of grassroots outpouring hadn’t been seen for any presidential candidate in decades, much less for a left-wing independent. 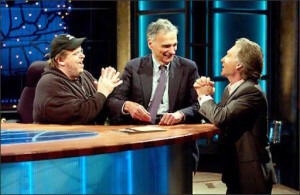 A big component of the campaign was the demand to allow Nader to participate in the presidential debates. The debates were, and still are, run by the Commission on Presidential Debates (CPD), a private corporation run by the Democratic and Republican parties. Starting in 2000, the CPD introduced new rules to block Nader, requiring a candidate to get at least 15% support in five national polls. This served to stifle the growth of third parties and limit public exposure to radical ideas. Clinton’s super PAC is falsifying the real history of Nader’s legacy and ignores the social movement built to challenge both parties of big business. They are concerned about one “fact:” Nader acted as a “spoiler,” taking votes away from Gore, which allowed Bush to win the election. Therefore, they argue, all the horrors of the Bush administration that followed, from the war in Iraq to No Child Left Behind, are entirely the responsibility of Ralph Nader. They warn anyone who dares build independent politics in the future that it will bring about the same horrors. This narrative, while repeated like a mantra among Democratic Party liberals, is a one-sided myth. It is a story told to suppress dissent rather than to genuinely learn from our history. Of course it is mathematically true that – according to the sharply disputed official vote count – Bush beat Gore in Florida by 537 votes and Nader won 97,488 votes in the same state. Had those Nader votes gone to Gore instead, the Florida vote would have flipped and, given the peculiarities of the electoral college, Gore would have won the White House. But this is only one side of the question. Even Bill Scher, while chastising advocates of independent politics for their “refusal to accept mathematical reality” is forced to admit, “Lots of factors can be blamed for such a paper-thin defeat”8 and the Nader vote is only one of those. He simply chooses to place all the blame on Nader because it’s politically expedient. The fact is, Al Gore won the popular vote in 2000, and it was only because of the undemocratic nature of the electoral college that Bush could win overall while losing the popular vote. Even if we accept the legitimacy of the electoral college, and focus exclusively on the Florida vote, the 97,488 Nader voters are dwarfed by the 308,000 registered Democrats in Florida who voted for Bush.9 Even then, this ignores the fact that the Florida vote was marred by voter suppression during a contentious recount. Amidst controversies about hanging chads and butterfly ballots was the direct suppression of thousands of voters, primarily in the African American community, who were illegally blocked from voting because their name happened to match that of a convicted felon. While this voter suppression was carried out by Florida’s Republican state government – led by Governor Jeb Bush, George’s brother! – the Democrats blocked an investigation of the abuse. When members of the Congressional Black Caucus pushed for an investigation, not a single Democrat in the Senate backed it.10 This was because the Democratic Party leadership cared more about protecting the legitimacy of the political institutions of U.S. capitalism than they did about stopping Bush and the Republicans from taking power. So while the Democrats actively covered up Republican voter suppression, Nader was blamed for Bush’s victory. The Republican theft of the 2000 election was sanctified by a sharply partisan 5-4 Supreme Court decision which blocked a proper recount of the Florida vote and handed the election to Bush. This deeply undermined the popular legitimacy of the Supreme Court as a “neutral” body, above the fray of partisan politics, but the Democratic Party leadership chose to accept the decision and make Nader their scapegoat. All this only deals with the question of how Bush became president. It doesn’t address how he was able to get away with his agenda. After all, the same people warning about the “spoiler” effect are those who defend the failures of Democratic politicians by pointing to gridlock in congress. Most of Bush’s right-wing agenda was only able to be passed into law with the votes of Democrats in Congress. Only one senator and a minority of Democratic congressmen voted against the USA Patriot Act. No senators and only one congresswoman voted against the war in Afghanistan. A majority of Democratic senators voted for the war in Iraq, including Hillary Clinton, John Kerry, and Gore’s former running mate Joe Lieberman. No Child Left Behind, Bush’s notorious crackdown on public education, faced stronger opposition from the Republicans than the Democrats. Unlike the Democratic Party leaders, Nader voters actually took to the streets to fight these attacks. We made a specific call to Nader, the Green Party, and the unions and other organizations that backed Nader, to convene local, regional and national conferences to discuss concrete initiatives that could build off of the Nader campaign and pave the way for a new party for working people.12 Despite the barrage of attacks blaming Nader for Bush’s election the anti-globalization movement continued to grow internationally, with massive protests in Gothenburg and Genoa. In September 2001, we were expecting the biggest anti-globalization rally yet in the U.S. The AFL-CIO had even endorsed it. This was cut across by the September 11 terrorist attacks, but a massive anti-war movement developed in its place. Unfortunately, Nader did not accept our call to push for a new, broad left party. He retreated from the public spotlight and returned to his life as a consumer advocate, allowing his presidential runs to become precisely “episodic mobilization around a single candidate.” This, and not his “spoiler” campaign, was Nader’s fundamental mistake. When the anti-globalization movement gave way to the anti-war movement, there were no clear structures, allowing a variety of informal forces to take unofficial leadership of the movement. Most significant of these was MoveOn.org, one of the earlier attempts at using the Internet as a force for social change. But as a layer of Democrats started taking an anti-war stand, MoveOn.org and other forces in the anti-war movement drifted closer towards the Democratic Party. By the 2004 election, anti-war demonstrations were being called off for fear of embarrassing the Democratic Party’s nominee John Kerry, who was calling for sending more troops into Iraq in an attempt to “out-hawk” Bush. On the political front, the main beneficiaries of the Nader campaign were the Green Party. This produced some important campaigns like Matt Gonzalez’s run for Mayor of San Francisco, and Peter Camejo’s gubernatorial run in California. But the Green Party was not without its problems. The party was structurally loose and lacked a clear anti-capitalist platform or working class orientation. It remained singularly focussed on elections rather than positioning itself as an organizing center for social movements. Internationally, the Green Parties generally accepted capitalism, with Green Parties in Germany and Ireland going into coalition governments that carried out austerity measures. The Greens in the U.S. were to the left of their international counterparts. But their loose structures meant they had little democratic control over their elected representatives. In the late 90s Seattle had a Green majority on the city council, but they failed to bring about any substantial change. When the 2000 election came around, the Green councilors publically declared they would vote for Gore if it looked like Bush might win. Two of them, Richard Conlin and Judy Nicastro, gave a more explicit endorsement to Gore, declaring “Never before have we had the opportunity to put into the White House someone who truly believes in being an environmentalist.”13 Both Conlin and Nicastro ended up breaking from the Green Party, with Conlin serving as an increasingly pro-business Democrat until he was unseated in 2013 by Socialist Alternative’s Kshama Sawant. By the time the 2004 election came around, Nader returned to electoral politics, but a lesser evilist “Anybody but Bush” mood had developed. This was an understandable reaction to the experience of Bush’s “War on Terror,” but it was consciously utilized by the Democratic Party establishment to wage war against Nader and anyone else who would challenge the two-party system. And the leadership of both the Green Party and the anti-war movement went along with that. Anyone concerned with fighting the Bush agenda was bound to be disappointed with his 2004 challenger, Democratic Senator John Kerry, whose hawkish embrace of the War on Terror demoralized the broadly anti-war voting base of the Democratic Party. People didn’t support Kerry. They opposed Bush. While this didn’t make Kerry a compelling candidate, it did make the “spoiler” argument much stronger and Nader’s 2004 campaign suffered for it. Much of the hostility to Nader stemmed from an understandable hatred towards Bush and his administration. But it was deliberately fanned by the capitalist media with a campaign insinuating that Nader was bought and paid for by Republican money. Hysterical articles were written every time an isolated Republican was found to have donated to the Nader campaign, despite being an insignificant part of the campaign’s finances. Ironically, today Hillary Clinton receives praise for winning the endorsement of Republicans like George Bush Senior. In response to the “Republican money” myth, Nader’s running mate, Peter Camejo, publically offered to return the few thousand dollars he received from Republicans if John Kerry would return the multiple millions of dollars he had received from Republicans.15 But this didn’t deter the attacks. Some of the attacks on Nader looked for unsavory allies to his left. Dan Savage’s Seattle weekly, The Stranger, published an issue with the headline “Ralph Nader is a Megalomaniacal Asswipe.” The central article revealed that Nader had been associating with “an organization named Socialist Alternative and a cursory examination of its website reveals it to be a Leninist organization that calls for ‘an end to the rule of profit’ in favor of ‘a socialist society to meet the needs of all.’ Ah, what company we are reduced to keeping these days, Ralph.” The article at least took solace that independent politics had safely been confined to “obvious fringe types.”16 Ironically, less than a decade later Dan Savage and The Stranger backed Kshama Sawant, Socialist Alternative’s candidate, in her 2012 race for state legislature and her successful 2013 campaign for Seattle City Council. The war on Nader was not limited to an ideological attack. The Democratic Party engaged in a barrage of dirty tricks to keep Nader off the ballot in as many states as possible. Across the country, the Democratic Party hired lawyers to file nuisance suits against Nader petitioners. Socialist Alternative members petitioning for Nader had their tables flipped over. When supporters of the Democratic Party insist we must all remember the Nader campaign, this is the part they want us to forget. In Pennsylvania, Nader and his running mate, Peter Camejo, actually were charged with voter fraud for sending in forged petitions and fined for more than $80,000. However, in 2008, twelve leading Democratic Party officials were charged with using millions of dollars of state funds to harass Nader petitioners. This included having Democrats pose as Nader supporters and turn in the forged ballot petitions, thus allowing the courts to sue Nader in the first place.18 But by this time it was too late. Nader had already been taken off the ballot. In the end, Nader was only able to make the ballot on 34 states, and he only received a sixth of his 2000 vote. But the Democrats’ millionaire establishment candidate John Kerry still lost because it was hard to galvanize people around a candidate whose sole selling point was “I’m not Bush.” This time around, no one could claim that Nader spoiled anything. The Democratic Party managed to get the widely hated George W. Bush re-elected entirely on its own. If Nader’s 2000 campaign served as an electoral vehicle for a mass movement, the 2004 war on Nader served as a means to hold back struggle. The anti-war movement had ground almost to a halt during the 2004 election. Nader ran one last time in 2008, but was dwarfed by Obama’s perception as a candidate of change. Nader had been unable to build a lasting organized political force and the Democrats were able to superficially cash in on the increasing hatred towards Bush. All this points to the limits of relying on individual left candidates or the Green Party’s overly narrow appeal. For Socialist Alternative, running independent candidates is not an end in itself, but a means towards building a new party of the 99%. Nader’s understanding of his own political role was all over the place. Sometimes, he would dismiss the real concerns people had about the threat posed by Republicans. Other times, he talked of how his presidential campaigns could push the Democrats to the left and bring in new voters who would elect down-ticket Democrats, specifically pointing to his role in getting Maria Cantwell (D-WA) elected to the Senate in 2000, thereby preventing a Republican majority.19 More problematic was his tendency, more pronounced in recent years, of looking to “left-right” alliances with right-wing populists. Socialist Alternative always argued that, rather than an ally, right-wing populism represents the negative consequences of the left failing to offer a bold, fighting alternative to the two-party political establishment. During Nader’s 2000 election we warned: “Unless activists build a viable left-wing political alternative, public frustration may lead voters to get behind Buchanan’s patriotic, racist, fundamentalist Christian populism.”20 Thanks to Nader’s campaign, Pat Buchanan’s was unable to tap into the anger that existed at Clinton. But with the politics of lesser evilism dominating left strategy since 2004, we saw our warnings confirmed. With no strong left challenge to the Democratic Party, reactionary forces like Ron Paul, the Tea Party, and Donald Trump have been able to gain support based on their perceived anti-establishment status. This is the inevitable consequence of years of the left tying itself to the Democratic Party rather than building a strong independent political voice for working people. On the other hand, we have seen a new wave of struggles: from Wisconsin, to Occupy, to Black Lives Matter. Bernie Sanders was able to tap into this new wave of struggle much like Nader did with the anti-globalization movement. Had Sanders followed in Nader’s footsteps and ran an independent campaign for president through the November election, he also could have paved the way for a new party of the 99%. While Nader’s movement never coalesced into such a party, and Sanders has refused to build such a party, both showed the growing potential to build a powerful left political alternative.